Angelo Bortolo Bertelli (June 18, 1921 – June 26, 1999) was an American football player. He won the Heisman Trophy in 1943 playing as a quarterback for the Notre Dame Fighting Irish. Bertelli born in West Springfield, Massachusetts on June 18, 1921 to Italian immigrant parents. At Cathedral High School in Springfield, he won all-state honors in football, baseball and hockey and was senior class president. 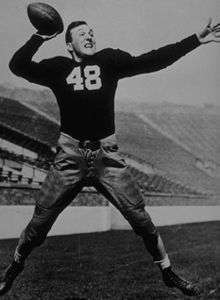 When Bertelli entered Notre Dame in 1940, he was 6 feet 1 inch and 173 pounds, a skinny but highly regarded tailback in the single-wing formation used by most college teams. When Coach Elmer Layden left to become commissioner of the National Football League, Notre Dame's new coach, Frank Leahy, immediately noticed Bertelli's passing talents. As a sophomore, Bertelli, still a single-wing tailback, led the nation with a 56.9 percent passing average, completing 70 of 123 attempts. In 1942, Leahy switched to a modified T-formation, in which Bertelli would play under the center and take every snap. As he told his budding star, "Bert, you're the finest passer and the worst runner I've ever coached." That summer, preparing for his new role, Bertelli said he took "a thousand snaps...maybe a million." Bertelli and the T-formation were an immediate success. He passed for 1,039 yards and 10 touchdowns. Celebrated sportswriter Grantland Rice referenced Bertelli as "the T-formation magician." While at Notre Dame, Bertelli enlisted in the Marine Corps Reserves in 1942 prior to his activation to active duty in the fall of 1943. In 1944, Bertelli was promoted to the rank of second lieutenant, where he served as an infantry and recreation officer. After stops at Quantico, Camp Lejeune and Camp Pendleton, Bertelli embarked to participate in combat operations in the Pacific. After arriving from Guam in February 1945, Bertelli fought in the Battle of Iwo Jima and was nearly killed when a Japanese mortar shell landed 15 feet away from his position. Bertelli returned to Guam in March and served in Sasebo, Japan, before returning to the states in March 1946. After World War II, Bertelli entered the Marine Corps Reserves where he was promoted to the rank of captain and served until 1957. On June 26, 1999, Angelo Bertelli died at the age of 78 after a losing battle with brain cancer. He was buried in Immaculate Conception Cemetery, Montclair. He is survived by his wife, the former Gilda Passerini and four children. Bertelli is the father of Robert Bertelli, better known as Bob Bert, a musician who played in Sonic Youth and other bands.